We have an extensive range of colourful coffee stock pouches for you to choose from with or without a valve. Choose from stand up, square bottom, side gusseted and open top in a variety of materials and finishes. We also stock coffee pouch tin ties and pouch heat sealers available for next day delivery to seal your coffee pouches. One of our pouch specialists will be delighted to discuss your requirements in more detail. What is a coffee pouch? 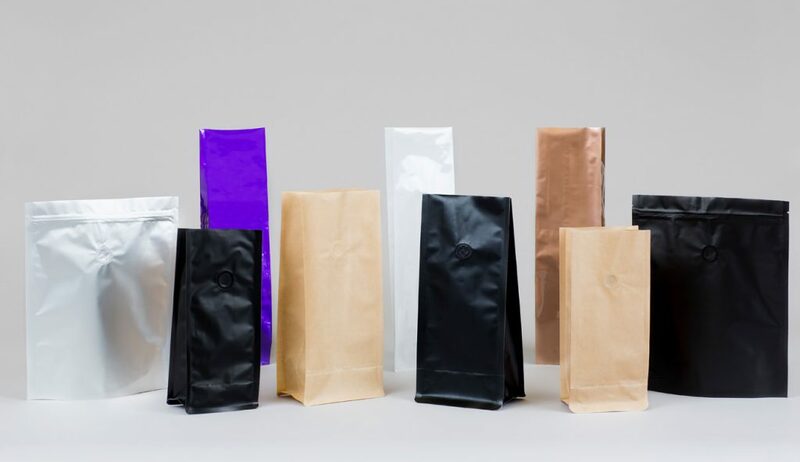 Depending on your requirements for your coffee bean packaging, both in terms of brand presence and product storage, there are a many plastic pouches for you to choose from: from grip seal pouches and side gusset pouches to stand up pouches and even spout pouches, the options are numerous. Tailor your coffee packaging to your business priorities. If your main goal is ease of transportation and storage, as well as convenience for the end customer, resealable pouches are an ideal choice. On the other hand, if your target is making an impression in a specialist shop or a crowded retail environment, choose a branded stand up pouch, which will really get your products seen. What are the benefits of coffee pouches? One of the many benefits coffee pouch packaging has to offer is the extra content protection –pouches are created using high barrier materials such as aluminium and VM-PET, which means they will keep your coffee or tea fresh for longer. Extended shelf life is a great benefit, both for retail environment storage and for household storage once the product is in the hands of the consumer. What’s more, if you choose to package your coffee in a polypouch you will have the flexibility to completely customise your coffee packaging design. Pouch packaging is fully adaptable to your requirements so you can better showcase your brand and feature a large printable area where you can display your coffee’s unique selling points such as the roast method, strength and origins of the coffee beans. You can also add special features like grip seal or tin ties and choose a gloss or matt finish to your coffee pouch packaging. View our stock pouches for more stock pouch packaging. After something more personalised? Let our team create bespoke pouch packaging for you.